When trying to open EMS you would receive a wall of red text which would essentially be complaining about receiving a 500 internal server error from IIS. In the Application logs I would see an MsExchange BackEndRehydration Event ID 3002 error stating that “NT AUTHORITY\SYSTEM does not have token serialization permission”. Something definitely seemed to be wrong with Active Directory as this was occurring on all 3 of the customers Exchange 2013 servers; one of which was a DC (more on that later). However, this current issue was affecting all Exchange 2013 servers & not just the one that’s also a DC so I was a bit perplexed as to what could’ve caused this. Eventually I found that the Exchange Install Domain Servers group had been added as a member of the Domain Admins group during the customers troubleshooting efforts to get all their servers added as DAG members. I removed the Exchange Install Domain Servers group as a member of the Domain Admins group & then rebooted all of the Exchange servers. After the reboots the issues went away & the customer was able to access OWA/EMS. Now this is where I had to explain to the customer that it was not supported to have an Exchange Server that was also a Domain Controller as a member of a Failover Cluster/DAG. This was why they were having such a hard time adding their Exchange server/DC as a member of their DAG. I have a saying that I came up with called “troubleblasting”. i.e. “John doesn’t troubleshoot, he troubleblasts!” It started out as just a cheesy joke amongst colleagues back in college but I’ve started to realize just how dangerous it can be. It’s that state you can sometimes get into when you’re desperate, past the point of documenting anything you’re doing out of frustration, & just throwing anything you can up against the wall to see what sticks & resolves your issue. Sometimes it can work out for you but sometimes it can leave you in a state where you’re worse off than when you started. Let this be a lesson to take a breath, re-state what you’re trying to accomplish, & if what you’re doing is really the right thing given the situation. 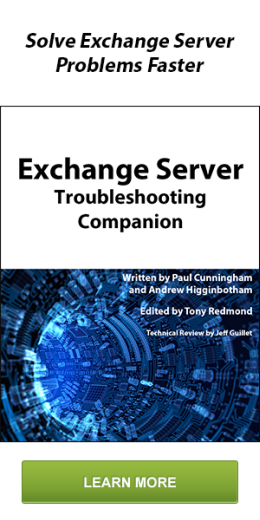 In this case, an environment was brought to its knees because a bit of pre-reading on supportability was not done beforehand & a permission change adversely affected all Exchange 2013 servers. I had a customer running SBS (Small Business Server) 2011, which runs Exchange 2010, who needed to renew their SSL Certificate as it had recently expired. I have quite a bit of experience with SBS since we have a large Support customer base running it & while it can be a pain to troubleshoot because of so many moving pieces (AD/Exchange/SharePoint/WSUS/SQL/RD Gateway all on one box) there are a few cool features. One of these features is the “Setup your Internet Address” wizard. Because SBS is also its own Certificate Authority the wizard will generate a certificate for you & assign it to Exchange/IIS/RD Gateway. It will also configure all the Exchange virtual directories for you as well as create a certificate install package for you to deploy to non-domain joined systems so your Outlook Anywhere clients will trust your CA. However, when going to re-run the wizard to renew the certificate I received an error regarding the Active Directory Certificate Service not running. The System event logs had a 7024 event from “Service Control Manager” stating “The Active Directory Certificate Services service terminated with the service-specific error %%939523546”. So we were unable to request a new certificate & the customer was hoping to avoid purchasing a third-party certificate since they had been working fine (for an extremely small shop) like this for several years. After researching the error, I found that the error code given pointed to the Certificate Authority database being corrupted. So I navigated to C:\Windows\System32\Certlog & I found an old friend; an ESE (Extensible Storage Engine) database file. If you didn’t know already, ESE isn’t just used for Exchange. AD Certificate Services, DHCP (C:\Windows\System32\dhcp\dhcp.mdb), & Active Directory itself (C:\Windows\NTDS\ntds.dit) all use ESE databases. The caveat however is that instead of ESEUTIL, you should use ESENTUTL to work with them. So I ran esentutl /mh <CA Name>.edb to view the header of the database file & found that it was in a Dirty Shutdown. I then tried to run a Recovery against the database by running Esentutl /r edb but this failed. If this were an Exchange database then this would be where I would try to restore from a backup. Unfortunately this customer did not have a backup of their CA database file (I think a lot of customers would fall into this category) so I had to move onto running a Repair which is the dreaded “/P”. I ran esentutl /p <CA Name>.edb & after it completed I was then able to start the Active Directory Certificate Services Service. All the proper data (including Issued Certificates & Templates) were still there & after re-running the SBS “Setup your Internet Address” wizard the customer now had a renewed certificate.